This course provides experience with the statistical tools that are available in the Wolfram Language. Topics include import and export of data, preliminary data analysis, descriptive statistics and distribution fitting, regression analysis, diagnostic testing, stochastic processes and time series modeling. Course topics are presented in sessions of lectures with small class size and ample opportunity for Q&A. The course is for those who have a basic working knowledge of the Wolfram Language and statistics. Properties and simulation of distributions, preliminary data analysis including descriptive statistics, visualization and fitting of data to underlying named and user-defined distributions. Linear and nonlinear model fitting. Comparison of models and various diagnostic tests are illustrated. Generalized linear models, piecewise continuous models, spline smoothing and automated curve fitting. Simulation, properties, classification, estimation and applications. Time series construction, dealing with missing data and irregularity, operations on time series. 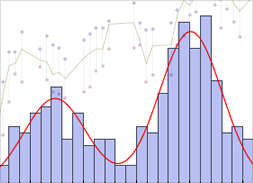 Various time series models, fitting time series models, model selection, forecasting, prediction limits.